Gudi Padwa also spelt as Gudhi Padwa is a major festival celebrated by Maharashtrians. Gudi Padwa 2019 will be celebrated on April 6 this year. It is the festival that marks the beginning of the Hindu New Year in the lunar calendar. The first day of the month of Chaitra is the celebration of Gudi Padwa. One of the most important traditions, that gives this festival a name is the hoisting of Gudi or a symbolic flag. 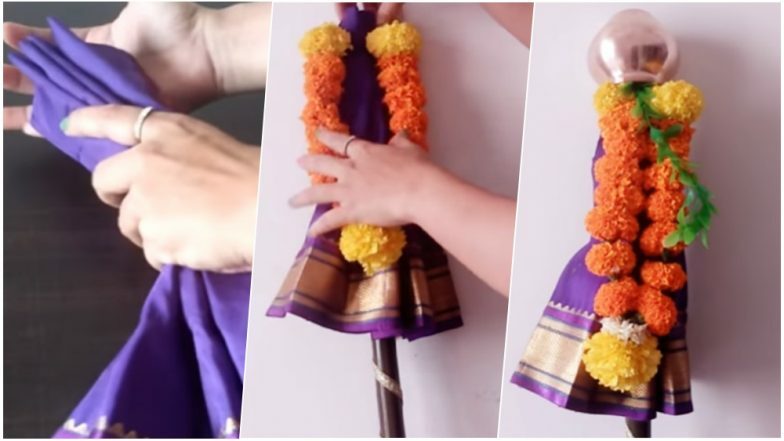 If you want to know how to make a gudi at home, let us help you out with the DIY procedure and video tutorial. A gudi is a flag made with an inverted copper vessel on a stick. It is covered with a piece of cloth or a saree and decorated with sugar crystals, mango leaves and a garland of flowers. Each of these items is symbolic and people hoist the Gudi as a mark of good luck and prosperity. The festival of Gudi Padwa coincides with other celebrations like Ugadi, Cheti Chand, Chitra Sukladi in different parts of the country. Gudi Padwa 2019 Discounts & Offers on Cars: Up to Rs 1 Lakh Benefits on Maruti Alto, Ertiga, Tata Tigor, Toyota Innova Crysta & Hyundai Grand i10 & Honda City. The Gudi or Gudhi is emerged in the windows or balconies of people to ward off evil and invite peace and prosperity. The pot represents purity, the cloth represents good values, the mango twigs represent immortality and the flowers are said to bring in positivity, keeping away the negative elements. As the festival is around the corner, market places are filled with miniature gudis and similar installations. Ready-made gudis are also available in some places. But most people prefer making the gudi on their own in their individual houses. If you do not know how to make a gudi, don't worry, let us help you out. It is very easy and you just need to get the necessary items to make a complete gudi. Gudi Padwa 2019 Advance Wishes: WhatsApp Messages, GIF Images and Facebook Greetings for the Marathi New Year. You can use either a silver or a copper pot, you can also use a mud pot. Most people use a jari saree to attach to the gudi. It also gives a choice of colour and a different appeal to your gudi. We hope the above video helps you get an idea to make your own gudi at home. Wish you all a very Happy New Year and Happy Gudi Padwa 2019!